These days, the milk choices in the grocery store are endless. 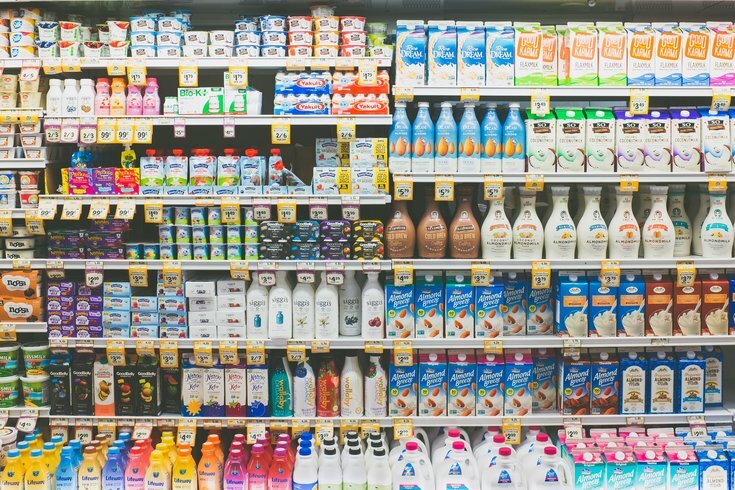 Though it wasn't always the case, the milk aisle in the grocery store has quickly become one of the most overwhelming to navigate: There is classic whole milk, healthy skim, soy for the lactose intolerant, nut milks for special diets, and coconut milk for...well, who really knows? It's a far cry from when the milkman would stop by with just any old bottle. Curious to know what the nutritional differences are between all these milks, we reached out to Cathy Ricker, a clinical dietician at Jefferson University Hospital, for an answer. Looking at the fundamentals, what are the primary differences between animal milks and nut milks? The other milks besides cow’s milks are considered non-dairy alternatives. They are different in calories, fat content and protein content. The tastes and textures are quite different as well. How's the calcium content compare? Cow’s milk has the best source of calcium you can buy. Other milks need to be fortified. Is there anything particularly bad about nut milks being fortified? There isn’t anything bad about buying a fortified milk! Many nut milks are fortified to make up for the nutrients naturally found in cow’s milk. Always read your labels and know what you’re buying. People generally stay away from whole milk because of the fat content, but is there an argument for consuming some whole milk? Whole milk has the highest content of calcium, Vitamin D and protein. Not a terrible amount. About 8 grams of protein per cup. • Nut milks have fewer vitamins and less calcium, but are often fortified to add those components. • Skim milk is more than OK as a fat-free alternative to whole milk. • Coconut milks tend to have more fat than nut milks. • Generally speaking, all of these milk options are acceptable. There's also a running notion out there that skim, on the opposite end of the spectrum, isn't always the best idea, either. In part because of a fear that sugar gets added, on occasion, to make up for the lessened taste. Does that actually happen, or is skim A-OK, generally? Fat-free milk has all of the nutritional benefits of whole milk, without the saturated fat and calories. Sugar would only be added if it was flavored. Skim milk has about the same nutrients without the fat. Are people getting what they need with, say, a coconut milk? That and cashew milks seem to be the latest to surface as "trendy." Coconut milk has more saturated fat than the other milk alternatives but is nearly as nutritious as cow milk and soy milk. How often do you have people switching to nut milks but going for the flavored ones, not realizing that's not actually better for you? Don't some people think vanilla and plain are synonymous? I remind my patients that anything flavored adds more calories and sugar taking away the “healthy” reason a person may switch to a non-dairy milk alternative. If you like the taste of vanilla almond milk, always opt for the unsweetened version. What's the deal with raw milk? Can someone safely consume that and are there any extra benefits? Raw milk is milk from any animal that has not been pasteurized to kill harmful bacteria. A wide variety of germs that are sometimes found in raw milk can make people sick. These germs include Brucella, Campylobacter, Cryptosporidium, E. coli, Listeria and Salmonella. Do the nut milks have any significant difference between them? Is there a difference between cashew milk and almond milk, for example? The calorie amount can differ from 25 to 150 calories per 8 oz.--25 calories for unsweetened cashew milk, or 150 calories for whole milk. Coconut milk has no protein, versus whole milk has 8 grams of protein. Whole milk does not need to be fortified and the nut milks do. So yes, there is quite a bit of difference. From a nutritionist's perspective, have you been surprised by the sudden diversity of milk options out there? Good thing? Bad thing? Somewhere in the middle? What's the general balance a person should look for, if they're consuming these milks as an "all of the above" approach? I am indifferent. If you have an allergy, one milk might be better than the other. The nutrient content of the other milks can be quite different and you might be missing out. Almond or soy is not bad, but you will missing the important vitamin D, calcium, potassium, niacin and protein found in cow’s milk. They should make sure the “nut” milk is fortified with these or ensure you get them from another source. For digestion, is one milk easier to get through your body than another? Obviously, whole milk will be taxing, but what about soy milk or coconut milk? There isn’t a particular milk that’s easier to digest. They all follow the same process. However, if you are lactose-free, nut-based milks will be easier on your digestion. If you have an intolerance to soy, you should avoid it as well. Some say coconut milk produces more fat in your stool which may cause discomfort. Listen to your body! Eat what makes you feel your best.